When there is a long weekend, I usually have a chance to have some of our group over for some gaming, food and beverages, I usually host at my place in the 'country' for a change of venue. With another nice long weekend on the calendar, we decided to get together on Monday for some Italy Campaign. The first game saw Andrew and myself, taking on Tristan and Rob in a 2000 points per side doubles game. Fighting Withdrawl was the mission in this game. 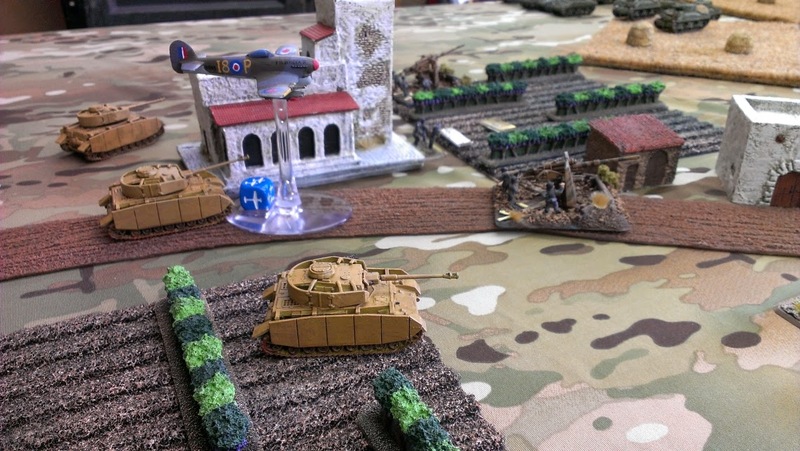 Andrew and myself played a Schwere Panzerkompanie out of Fortress Italy, made up of Tigers, one Elefant and some Panzer IV H's. We threw in some PAK 40's and 88's for a small anti-tank boost. 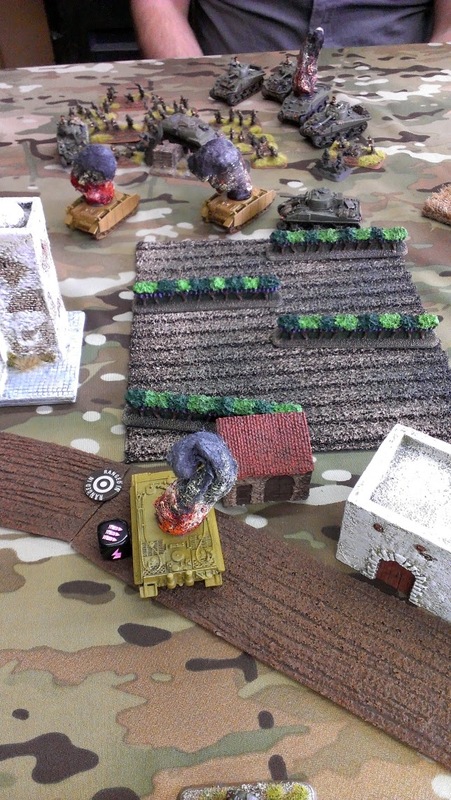 We faced American Rifle Platoons and tons of Rob's Canadian Armor! 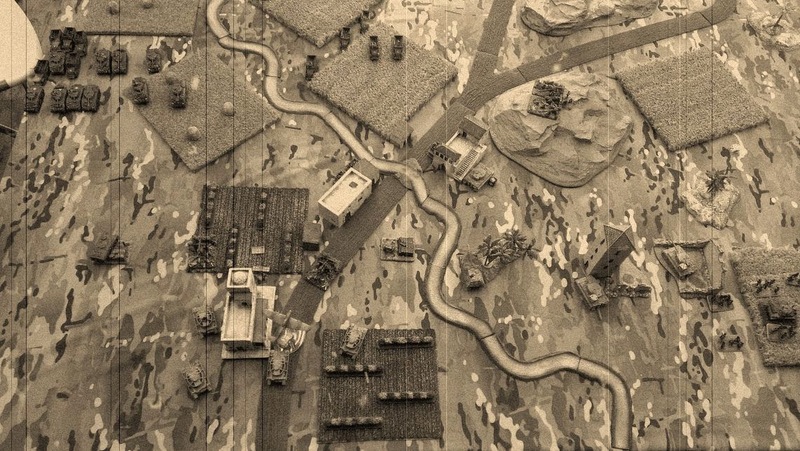 Reconnaissance photo show the Germans control the southern road and the vineyards west of the river. They also control the objective east of the church. Panzer IV H's look on, as the Royal Airforce comes in for the attack! Andrew and I could only look on for most of the match as we were either being hindered by smoke on the battlefield or re-positioning our armor to deal with trying to cover three objectives! The remaining Panzers move in to try and stall the Canadian's for a turn or two so they could withdraw the objective, denying the Allies precious supplies. This game was a short one, we ended up only play 3-4 turns before it was too much and the Germans were routed off the table in defeat. 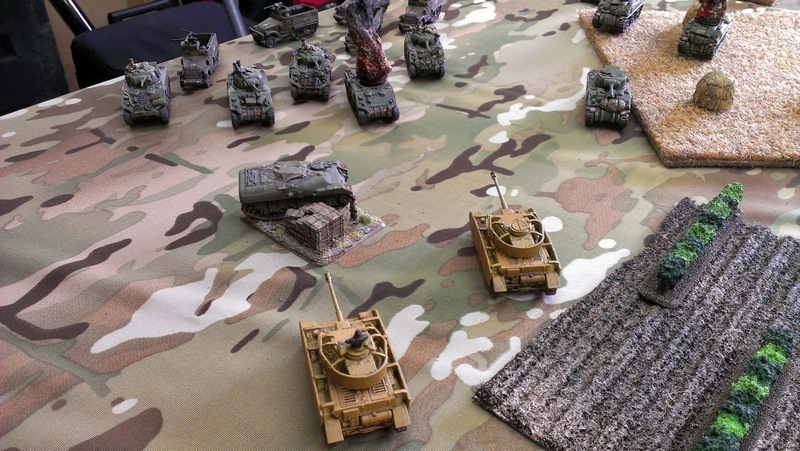 Without the ability to destroy the sheer number of tanks on the table, Andrew and I played 'catch-up' nearly the whole game and reacting to a very aggressive attack by Rob and Tristan! Wrecked hulls of German armor strew the battlefield as the Allies take the town, capture the objectives and regroup in case of counter attack! Looks like an epic game. No mention of my bazooka hit (on a 5+) on the side of your Tiger, that you then failed your Armor Save and I made the 5+ do destroy?!?!?!? It was EPIC! Italy Campaign Long Weekend....part 2!